Anihan Technical School 2014 graduate, Lealyn, is a sous chef of The Black Pig Charcuterie, Bar and Restaurant. Anihan 2014 graduate, Lealyn Malagamba, hails from Alaminos, Laguna. While studying in Anihan, she did her on-the-job-training at Bellevue Hotel in Alabang where her potential as a good kitchen staff showed. Bellevue Hotel would have wanted to absorb her as an employee after she graduated but all positions in the hotel were filled at that time. A new restaurant, The Black Pig, newly opened when Lealyn graduated. The Black Pig's Spanish executive chef needed kitchen staff and Lealyn was immediately employed. He was impressed with Lealyn's work and attitude. 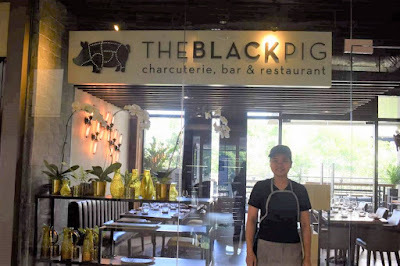 Now Lealyn is a sous chef at The Black Pig, together with another Anihan graduate. As a sous chef, she manages the kitchen in the absence of the head chef, her opinion is asked when the establishment hires new staff, and she also helps evaluate their trainees’ performance. Lealyn's father is a farmer and her mother is a housewife. Lealyn has an older sister who stopped studying after graduating from high school in order to help her parents by working as a cashier in a supermarket in Alaminos. This allowed Lealyn to continue studying until she graduated from Anihan. With her work at The Black Pig, Lealyn is carving out her professional path in the culinary field while being a great support to her family, generously shouldering much of their family expenses.